Dodging the Draft Because of God?! Never in history have religious Jews hidden behind Torah study to evade defending Jewish lives. I am a platoon sergeant in the IDF. I am a religious Jew. I am a platoon sergeant in the IDF because I am a religious Jew. Days ago, hundreds of thousands of religious Charedi Jews gathered in Jerusalem to protest the idea that they should be drafted into the army like every other Jewish citizen of Israel. A similar demonstration was held this week in New York. They didn’t call to renounce their Israeli citizenship or demand mass emigration. On the contrary, the same Charedi leadership who organized the protest continues to demand that the country they refuse to serve, service them and fund their institutions. This, they claim, is the Torah law and the will of God. To a secular mind, this position is ludicrous and unacceptable. To my religious mind, it’s immoral and profane. It is nearly impossible to find a precedent in all of the Tanach, the Talmud or Jewish history that Jews did not go out to defend their country together. There is not one time where Jews were exempt from fighting alongside their brothers because they were learning Torah. Joshua, the spiritual leader and commander of the first Jewish army in the land of Israel is commanded by God in the first chapter of his book that “the Torah shall not depart from your mouth day and night”. In the Chareidi paradigm, after hearing a direct command from God to learn Torah all day and all night, we should expect read about the houses of study he established and learn the spiritual wisdom the Torah scholars of that time revealed. Instead, we see that for the seven years (and 23 chapters), Joshua goes out to battle with all of his people. Ironically, those passages in the first chapter in the book of Joshua are the primary textual source for the commandment to learn Torah. It is also interesting to note that the book of Joshua is written in the backdrop of another story. Segments of the nation of Israel considered settling down before the full conquest of the land. Moses sets a precedent – when some of Israel have to serve in the army, all of Israel have to serve in the army. King David, the author of so many of our treasured prayers, also went out to battle. With a Torah scroll by his side at all times, he led his men in war and toward peace. The Maccabees were priests in the Holy Temple. Matityahu was the high priest and his son Judah a priest as well. But before they could serve their role in the Temple, both of them led the military revolt against the Greek empire in the days of Hanukah. Rabbi Akiva, the Torah giant of the Talmud, led his students to war under the leadership of Bar Kokhba against the Roman occupation in Israel. For those who can’t find value in the Jewish State and therefor refuse to defend it (or even thank God for its existence on Yom Ha’atzmaut), a religious re-education is in order. There has never been more Torah study in the land of Israel in all of our history. More synagogues, mikvas (ritual baths), Yeshivas and seminaries have been built by the modern State of Israel than ever before. In quantifiable numbers, the amount of people learning Jewish studies today in our modern State dwarfs anything that King David, King Solomon, Ezra, Nehemiah, the Hasmoneans and Rabbi Akiva ever produced. Outside of Israel, the greatest Yeshivas like Volozhin and Lublin had no more than 300 students. Even the legendary institutions of Sura and Pompedita are only estimated to have had approximately 1,000 students. 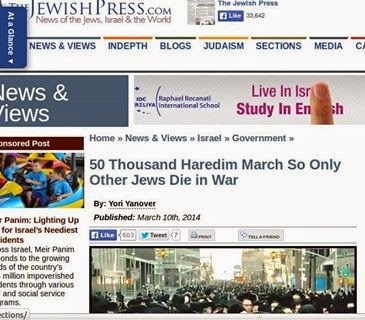 Just the fact that hundreds of thousands of Torah students exist to protest is reason enough to celebrate the country. While Judaism rejects Plato’s notion that the discipline of army life is a necessary ingredient of an ideal education, only the modern State of Israel with a trained military could have transformed our shattered and devastated people after the Holocaust into a new spiritual empire. While it is forbidden to rely on miracles, we live as a free people again today because of the brave dedicated soldiers in IDF uniform. Only a few decades ago Jews wore a different kind of uniform. It had stripes and a yellow star. In this sense, the popular demand “to share the burden,” creates the wrong discourse and misses the heart of what it means to be a Jew in our country. Serving in first unified Jewish army in the Land of Israel since the times of King David is not a burden; it’s a privilege, an honor and a miracle. It is unconscionable for a religious Jew, living in the Promised Land, connected to his heritage and his history not to want to serve in the army. Although the ultimate Jewish vision aspires to no army, no soldiers and no weapons of war, the story of the modern Jewish army is the next chapter in the ongoing saga of Jewish history. The secular messianic Zionist philosopher, Israel Eldad articulates this point best in his book ‘The Jewish Revolution’. “Some time in 1953 a remarkable series of ancient letters was discovered in the Judean desert. These were the letter of the last commander of Judea, Simon Bar Kokhba, the leader of the last great revolt against the Romans and the Nasi (“prince” or president) and perhaps also the king of Israel in the years 132-136 CE. The letters addressed to commanders in various theaters of operation, were personally signed by him. Now they are on display at the Israel Museum in Jerusalem. This by itself is an outstanding archeological discovery. But it is not the most miraculous part of the story. The true miracle lies in the fact that the person who discovered the letters of the last Jewish commander was the well-known archeologist, General Yigael Yadin, effectively the first commander of the new Jewish army. I recommend that my friends, both in Israel and abroad, go to see those letters. Whether or not one understands the meaning of the words, their message is clear. The story of the Jewish People continues and we are the next chapter. What Eldad does not discuss is what Bar Kokhba wrote and how relevant his message is today. He orders his men to deliver Lulavs and Etrogs (Palm branches and citron fruits) to his men in the battle field. It was the holiday of Sukkot and his pious, religious, Torah observant soldiers wanted to serve God while they served in His army. A final call from the days of Rabbi Akiva to our day never to forget that serving in the Jewish army is not a secular burden, but a religious duty. Rabbi Jeremy Gimpel is the host of “Israel Inspired Radio” on iTunes, the creator and host of the TV show “Tuesday Night Live in Jerusalem”. He currently serves as the Deputy Director of the World Mizrachi Religious Zionist Movement. The opinions expressed herein are his own. The JP Gets It Right - For Once!